I'm working on compiling resources for a panel discussion at this year's CBFNC General Assembly. The Panel is titled "Social Networking and Religion." The other panel participants are Trinity Whitley, Christina Whitehouse-Suggs, and Sam Harrelson - an all-star cast if you ask me. The theme for the conference is "Living Justice & Mercy," so we are working on ways to incorporate instances of social media and social justice intersecting. In doing so, I have come across two very worthy projects. Pitch: In a time when communication is all around us, we felt it was necessary to give a voice to the people who needed it most. Between Jan. 2009 and Jan. 2010 the total number of unsheltered individuals within New York City rose an estimated 34%. 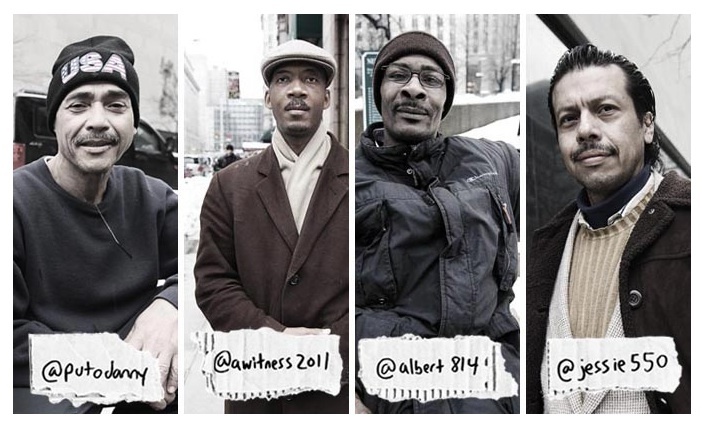 We gave Danny, Derrick, Albert and Carlos- four homeless residents of NYC- prepaid cell phones and Twitter accounts. Get to know them by clicking on the images above. Pitch: PROOF: Media for Social Justice uses photography as means to inform and educate global audiences about human rights. Powered by a strong belief that visual media is a unique and potent tool in the fight for human rights, we empower future generations to work for social change. Our work focuses on individuals whose lives have been dramatically altered by violence or genocide: rescuers who cross lines of hatred to save the lives of neighbors and strangers; survivors of atrocities who live in evolving but still fragile societies; and child soldiers coerced into committing acts of horror. Check out both of these projects and get involved in any way you can.